"The concert was just beyond expectations! I've been speechless and dumbfounded for days." and the music they make together is truly extraordinary." "Their Jazz is reminiscent of Stéphane Grappelli, but even better." that I can no longer listen to ordinary Jazz." "A great event... a world-class musical treat!" The ANTONEVICH & KATZ duo delivers a sizzling fusion of American Jazz and European Gypsy music, featuring Jazz favorites arranged for violin and piano in the European Gypsy-Jazz style. 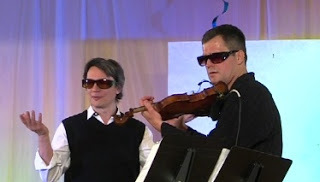 Its members, violinist Stanislav Antonevich and pianist Leo Loginov Katz, are professional musicians of Eastern European origin, with superb credentials, unusual backgrounds, and complementary talents. Stanislav and Leo have great fun working together, and hope that their duo has a long future ahead. Stanislav is a virtuoso violinist known for his passionate delivery that touches the audience’s soul. He offers a unique combination of award-winning classical musicianship and dazzling Jazz sensibility. 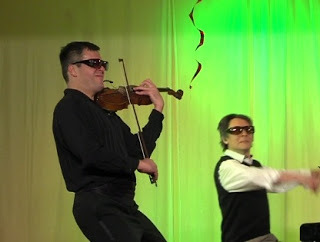 Most classical violinists find it very difficult to adapt to the Jazz genre; improvisation is often the most challenging, because classical training emphasizes strict adherence to the original score. In addition to rigorous classical training, Stanislav obtained Masters' degree in Jazz from the Longy School of Music, and took workshops from the well known European Gypsy Jazz violinist Vitali Imereli. Leo is a jazz pianist with a life-long interest in improvisation and experiments with sound. This brought him in conflict with the strict rules of the Russian musical establishment. As a result, he chose a profession in Theatre, studying acting and directing at the Russian Academy of Theatrical Arts. His fruitful mix of musical and theatrical skills has brought him numerous accolades, making his performances “energetically generous, never predictable and always entertaining”. Gypsy jazz (also known as gypsy swing or hot club jazz) is a style of jazz music that originated in Europe in the 1930s, propelled by stars like Django Reinhardt and Stephane Grappelli. The instrumentation of violin and piano featured by the Antonevich & Katz Duo is uncommon for Gypsy Jazz, giving their music a unique sound. Usually, acoustic guitar and violin are the lead instruments, with one or more rhythm guitars for the percussion section; bass, clarinet and accordion are also common. The duo’s performances, which are typically sold out, are known for their deep emotional sense, exquisite taste, and refreshing humor. 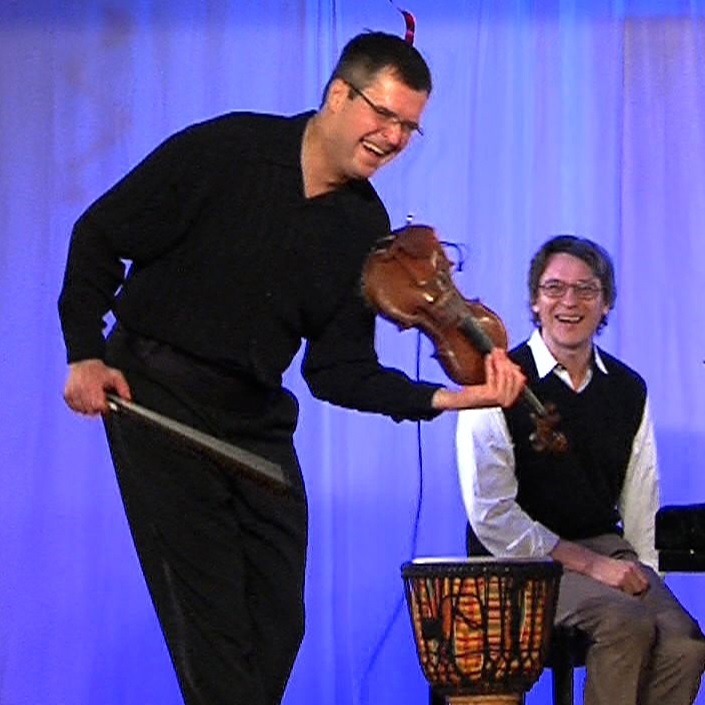 A recent reviewer at a sold-out Boston concert said "Their music is reminiscent of Stephane Grappelli, but even better". Be prepared for a world-class musical treat! In addition to rigorous classical training, which includes a Masters' degree and an Artists' Diploma in Violin Performance from the Longy School of Music, Stanislav received Masters' degree in Jazz from Longy. Stanislav also took workshops from the well known European Gypsy Jazz violinist Vitali Imereli, a protegé of the late great Stephane Grappelli. When performing, Stanislav strives to find arresting interpretations of the music that touch his listeners’ soul. His playing has often been described as “exquisite”, with “impeccable” intonation and an “unforgettable” tone. To see his full bio, and to listen to more clips of his music, please visit www.StanislavAntonevich.com . Leo Loginov Katz was born in Saratov, Russia, and began playing piano when he was 4. Leo’s strongly developing passion for improvisation and experiments with sound conflicted with strict rules of Russian musical schools, so he chose a profession in Theatre. He studied acting and directing in St. Petersburg and Moscow. Before and after he graduated from The Russian Academy of Theatrical Art he played at several jazz and rock festivals, composed music for movies, circus and theatre shows. The fruitful mix of musical and theatrical skills earned Leo numerous credits as performer/director/composer from likes of Rosetta LeNoir Musical Theatre Academy (AMAS), The Actors Studio, Brooklyn Academy of Music, Public Radio International, The Ringling Bros. And Barnum & Bailey Clown College, and many more. In early 2004 Leo joined the legendary Dr. Stanley Taub to form “VIP of NYC” (Virtuoso Improvisation Pianists of New York City), a group that has produced a series of successful concerts at The Chamber Music Society of The Lincoln Center, Yamaha Piano Salon, and Steinway Hall in New York City. Critics and fans agree that Leo’s musical performances are “energetically generous, never predictable and always entertaining”. Video about the town's First Night event, featuring A&K performance of Limehouse Blues. The long-awaited Antonevich & Katz CD is finally out! 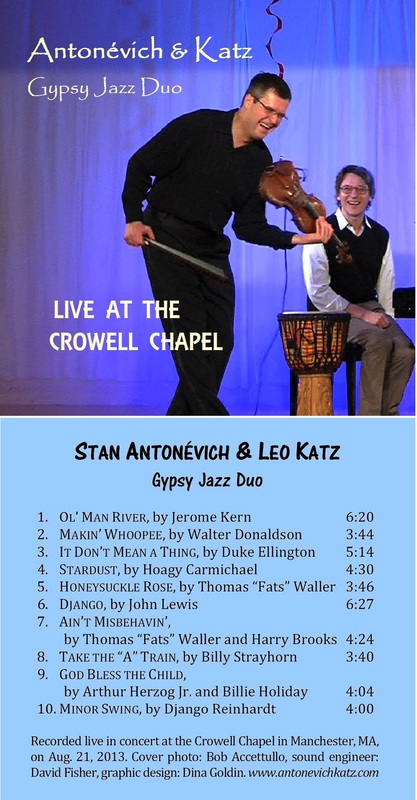 Gypsy Jazz pieces, recorded live in concert at the Crowell Chapel in Manchester, MA, in August 2013. Get one for yourself, and another as a gift! Do you wish to be added to our mailing list for future concert announcements? or in obtaining a demo copy of the CD?